My office, Keller Williams Larchmont, has found inspiration from one of our fellow agents, a survivor or Leukemia. 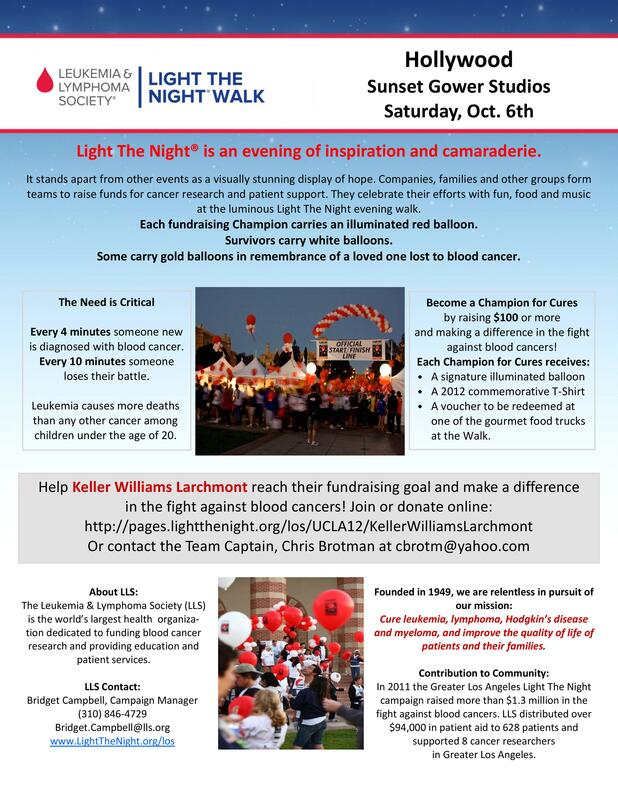 In his friend’s honor, who most likely will not be so lucky to survive the disease, we, as an office, have decided to participate in the Light The Night Walk at Sunset Gowers Studios, Hollywood on October 6th, 2012. This cause hits close to home for me, so I am reaching out to you, my readers, to ask you to please help us with your financial support, and of course, we would love to see you out there, too! Please click here to donate as a tribute to this great cause and to help us in the effort to save lives.